Ocean Creatures Theme Boy Bedroom could be a nice addition to your boy bedroom decorating ideas under the section of water related design ideas. My little curious and adventurist three years old boy has a pursuit of living under the Sea. The reason might be the connection to the water or watching all the ocean related cartoons. When I was looking up the Ocean Creatures Theme Boy Bedroom pictures, he sat on my lap and helped me to make a good bunch. So, this time my article will be on naïve side. In Ocean Creatures Theme Boy Bedroom , the color selection is limitless. You may stick the classical main colors that are blue, turquoise, pastel greens, and gray tones. For these classical colors, complimentary colors are the coral tones, light yellows and sand colors and white. But, when you discuss with your little one, any color is fine to decorate the room. Fabric choice can be printed or plain. 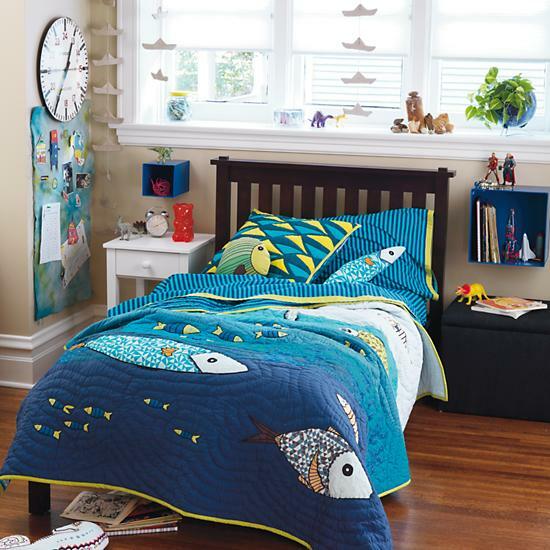 Ocean Creatures Theme Boy Bedroom is defined well with any fish. The starfish, clam, crab, octopus, jellyfish, turtle, corals, kelps and seaweeds, fish net are bonus. I am hoping that, your little boy’s mind is very helpful to get together all the design elements in Ocean Creatures Theme Boy Bedroom. As I mentioned, pictures had been selected with a little boy. His taste might be contagious in ocean creatures theme boy bedroom. Picture Credit: Land of Nod. The bedding is all about the fish. Panel bed with headboard is espresso color. the magnet board and magnets are the ocean and ocean creatures. The decorating origami sailing boats are simple and nice.Nightstand and storage ottoman are very creative with wall shelve . And sea horse accent pillow on the hardwood floor. Picture Credit: Beazer Homes. Wall mural octopus and octopus accent pillow , boat shape platform twin bed with navy blue bedding, cappuccino nightstand and dresser, beige area rug , fishnet and rope table lamp and other ocean accessories are in harmony. No need to go blue tones to define the ocean creatures. Picture Credit: Jarlath Mellett. Very simple and chic boy bedroom design. Eclectic Wall Paper with ocean creatures theme boy bedroom brings all you desire into the room. My son’s favorite 🙂 Round blue rug, striped bedding and jelly fish floor lamp, bean bag ottoman and footboard of the panel bed is an open shelve white dresser. I think the owner of this room had been pleased without any difficulty. Picture Credit: Siddons Design Team, Decorating Den Interiors. Under the sea all the fins are dancing on the surface of the wall paper .In the aquarium some turtleand corals, lion fish sat on the top of sunken treasure dresser and some other salt water creatore murals on the other wall. Plaid fabric bedding and matching ottoman are awesome match. I am thinking ahead surfing on the ocean for boy bedroom ideas. I would be more than happy to delight you with my coming article.